Well, it looks like I’m sort of back in business, with a shiny new laptop and a huge learning curve. A lot of changes have occurred to computing in the past eight years and I’m slowly figuring out how to work this new machine. I’m still trying to improve on my photo editing, so please excuse the below par pictures in this post. 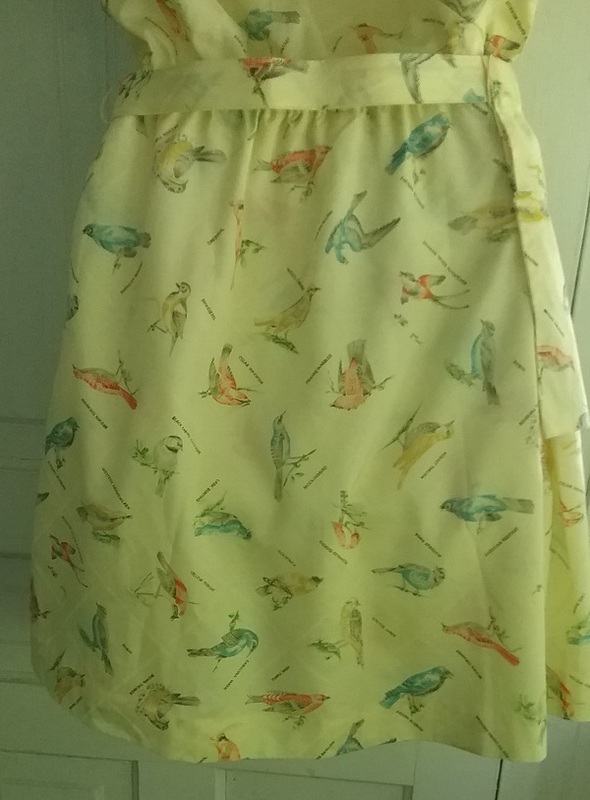 I first spotted this great culotte dress on the Vintage Fashion Guild forum. Every week member sellers show off what is new in their shops in a feature called Fresh Vintage, and it’s a great way to see “new” things as they hit the stores. This came from the etsy shop of member Racked Vintage. 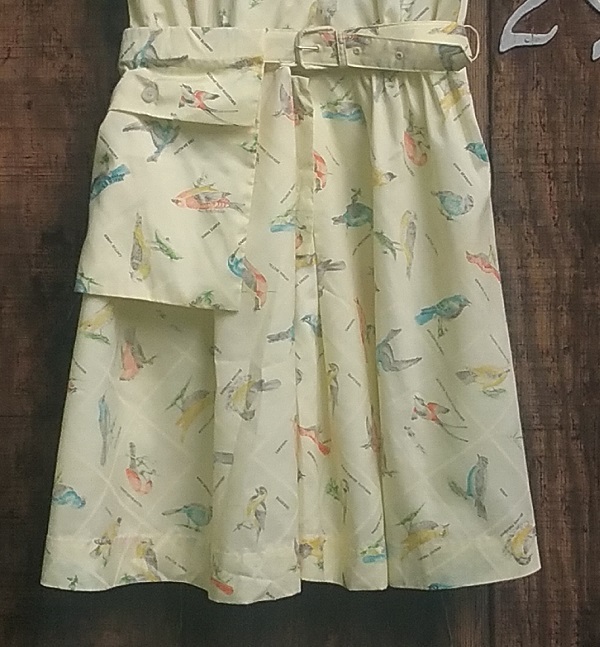 At first glance this looks to be a dress, but it is actually a culotte dress, and I’m pretty sure it was designed as a golfing outfit. The front of the skirt is a bit full, which tends to disguise that the skirt is divided. The back goes even farther with the deception, as there is a skirt panel sewn over the culottes so that from the back it looks like a straight skirt. My thinking is that the garment would have been very useful in places where the dress code required women to wear skirts in the clubhouse. It would also be useful in transforming from golf course to city street. Another feature that shows the duo nature of this piece is the large removable pocket. It’s quite necessary when trying to keep up with the paraphernalia of golf, but off the course it just looks a bit odd. So the designer put the pocket on the belt where it slides off and on. My photos are so poor color-wise. 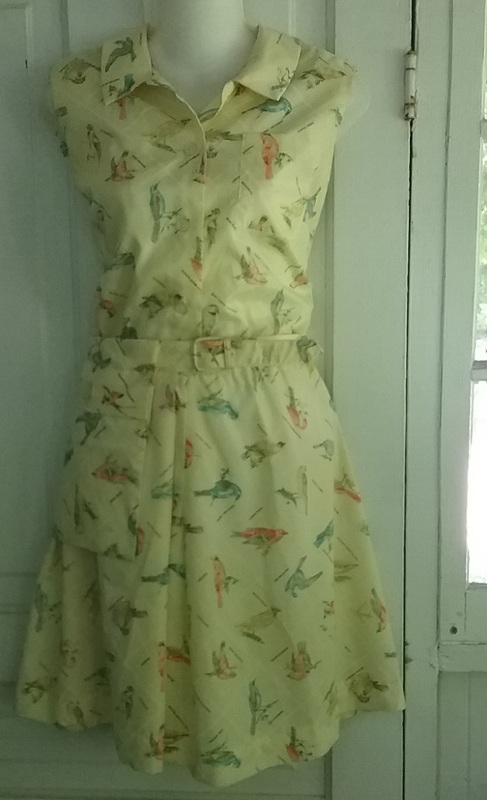 This dress is a very pretty yellow, and the birds, while not always accurately colored, are in nice shades of red, gold, blue and green. I had never seen this label before this dress, and I love how it hints at the two functions of the dress. The owner got a duo of dresses in one. 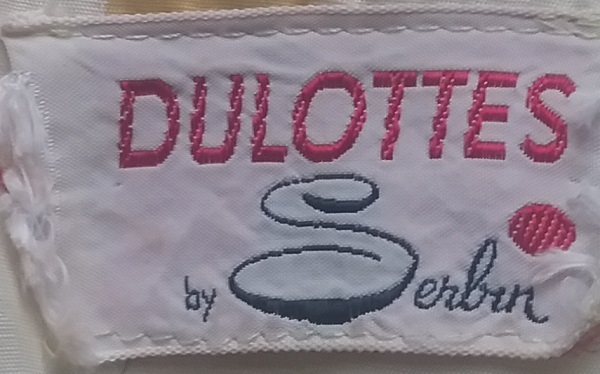 I got a bit lucky in researching the label as Serbin had the name dulottes trademarked. At first glance this dress appears to be from the early 1960s, but according the the trademark application, the label was first used in 1967. There are often mistakes in trademark applications, due mainly to the passage of years between the time the name was first used and the time the application was made. But in this case the first usage and the application both happened in August, 1967, so I’m sure it is correct. In 1967 and 68 there was a softening of women’s fashion. The mod look was still going strong, especially among the young, but if you look at magazines from the later 60s you see a bit of traditional femininity returning in the form of gathered waists, soft collars, and even ruffles and lace. I’d put this dress in the spring of 1968. Now to find an ad to support that bold claim! It’s time to update a few old stories. I wrote about the above golf set almost a year ago. 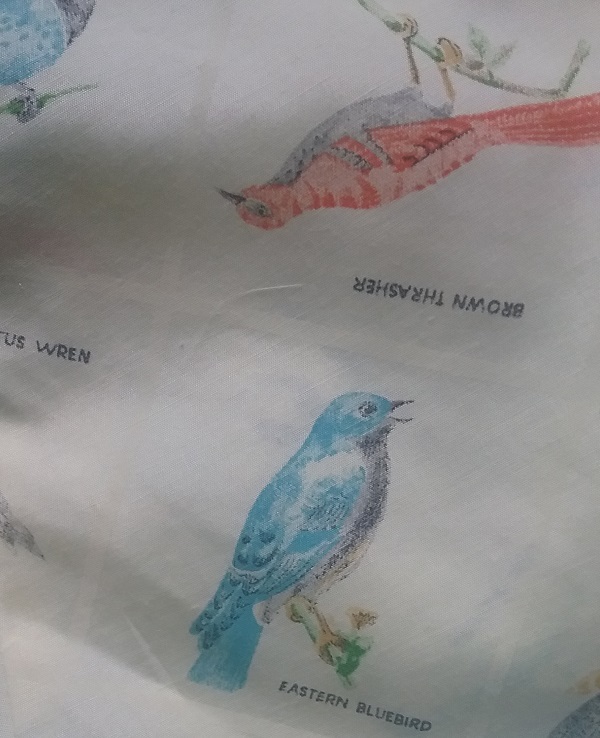 It is from Serbin of Florida, had had a Marianne by Serbin label. As I’d hoped, I have heard from Marianne Serbin Friedman, and she is in the process of answering some questions about her family’s company. Stay tuned! The photo above was sent to me by Pam of Glamoursurf. 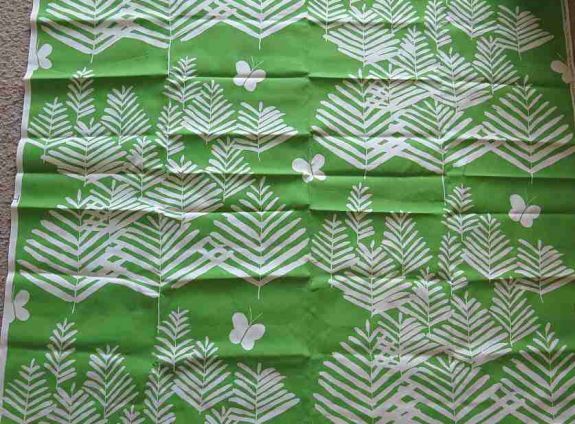 Two years ago I posted an ad for fabric that Vera Neumann designed for Schumacher in the 1950s. In my post I stated that Vera signed a licensing agreement with Schumacher in 1947 and that it lasted for ten years. 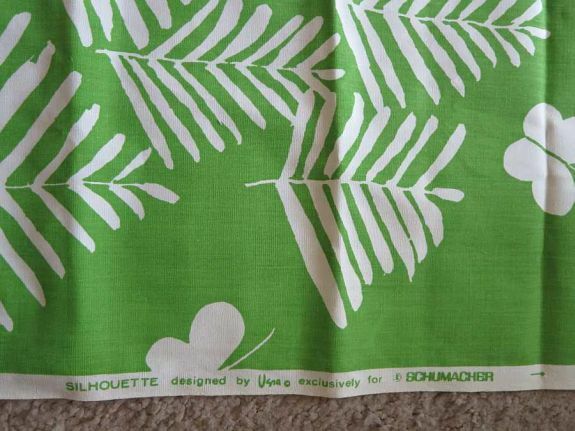 Evidently, Vera did a later project with Schumacher, as Pam found an ad for a similar fabric to the one above that was dated 1979. It always pays to keep an open mind when reading anything about history. There are no absolutes that I know of. 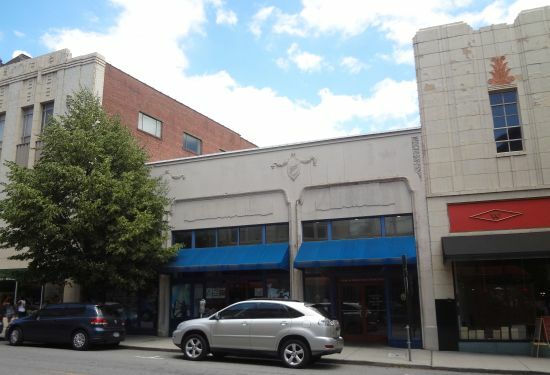 And finally, I wrote about Lou Pollock’s Asheville shoe store last year. It was a real treat hearing from his daughter. I am the youngest daughter of Lou Pollock and you brought tears to my eyes.I was raised in that store and learned when I was very young – how to give to the community. My father not only gave away shoes to children in need on Christmas day – but to care for them 364 days during the rest of the year. I learned. Later in years my husband and I were in the children’s wear business in Michigan and the 1st Christmas came along – our thoughts turned to the children and (without details) we carried on the lessons given by my father. He was also one of the founders of the cemetery in West Asheville in 1916 and made a dream come true to create hallowed ground for our ancestors. The Cemetery honored him while he was still living – by re-naming it in his honor. The Lou Pollock Memorial Park where he and the rest of my family are all buried. and Children’s. There were 2 floors. 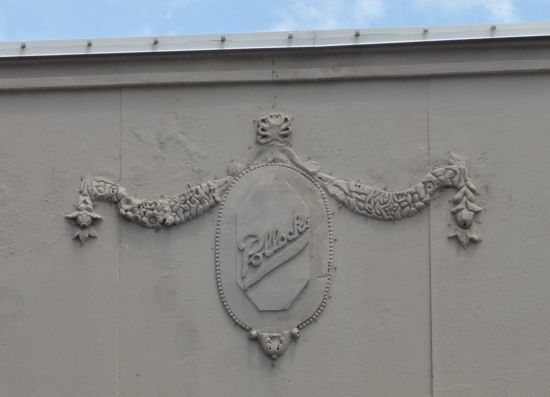 Did you see the SHADOW of the letters POLLOCK’S on the wall where the letters were removed when remodeled? They still remain. Thanks for remembering my Father in such a special way, I have many memories still alive on Patton Avenue and Haywood Street. That is from Betty Pollock Golden, who is 89 years old. One of the difficult things about collecting clothing is that often one finds just part of an ensemble. As a collector of sportswear that often does not matter, but it is always a treat to find an outfit in its entirety. Having the top or the skirt of this set would be nice, but it is so much better having both, plus the matching belt. Serbin was founded in 1943 by brothers Lewis and John Serbin in Cleveland, Ohio. In 1951 Lewis Serbin moved his family and the family business to Florida. There the company focused on golf wear and casual dresses. The Serbins had a daughter, Marianne, and I’m guessing that she is the Mari*Anne on the label. At some time she married and her name was Marianne Serbin Friedman. The quilted skirt is covering a pair of shorts made from the same fabric as the top. It feels to be a cotton/poly blend. The buttons are a type that was popular in the late 1960s, ball-shaped plastic covered by a matte paint. 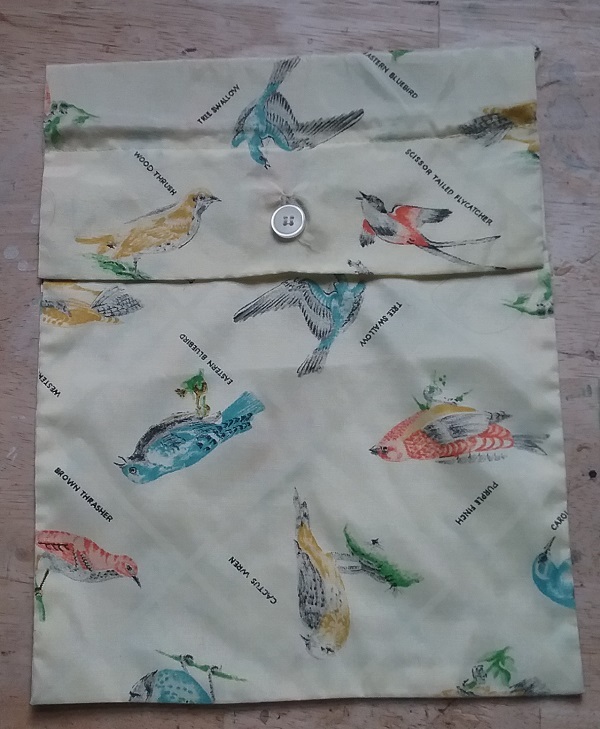 There is a nylon zipper in the shorts and in the back of the top. The belt matches the bias trim on the top and the skirt. I have not firmed up a date, but my best guess is late 1960s. Besides the buttons, there are other clues. The A-line shape of the skirt was a popular one at that time, as was the cotton/poly fabric. I’ve not shown any of the interior details, but the seams are pinked instead of serged. That tends to mean a manufacture before the mid 1970s when the serger became widely used, but it pays to remember that smaller companies could not always invest in the latest machinery. Novelty prints are really more associated with the Seventies than they are the Sixties, but when it comes to golf wear, anything goes. Any other thoughts? And I’d sure love to hear from the Serbin family.